We’ve made it to the end of the Grammy Gold road and it has been nothing short of an emotional rollercoaster. Between Elts and I ending a decades long feud, Salt-n-Peps shooping over to down some squid, Braff and I also working to rekindle a friendship, Nells dropping by to convince me she was still making music and well, barely surviving the sexual tension between groffsauce and I, I am absolutely spent. But hold up, that doesn’t mean our final visit was going to be cancelled so get in formation – my favourite Knowles-Z, Beyoncé, is finally dropping by for a visit! As you know, I’ve been a close member of the Knowles clan since starting a fight club in (Whitney) Houston and Bey and I have been best friends ever since. That being said, I sadly haven’t seen Bey in the flesh since the infamous Met Ball of 2014 … though I was the first to find out about her latest pregnancy. Also yes, the rumours are true – if they are both girls, she will be calling them Kelly and Michelle and if they are boys … Ben and Jamin. Anywho, Bey appeared – nay, manifested – under the cover of darkness to avoid alerting the media to her pre-Grammy visit and ran straight into my arms. We held each other like best friends do and laughed – though I think a part of her was serious – in front of a large wall of imported flowers, covered in a veil, while discussing the upcoming awards. I’d like to make one thing clear – yes, even Bey thinks she is going to sweep the pool. But who can really blame her? I mean, she has already won 20 Grammys and we both know that the academy is terrified of getting yelled out by our mutual friend Kanye. Despite it being an evening catch-up, Bey had one pregnant craving she needed me to help with, so I gladly whipped up a big batch of my Beygel Knowles. I love bagels. Love them. So much. I mean, if you could marry a food I would have put a ring on it already. My favourite, like these babies, are cinnamon and raisin. 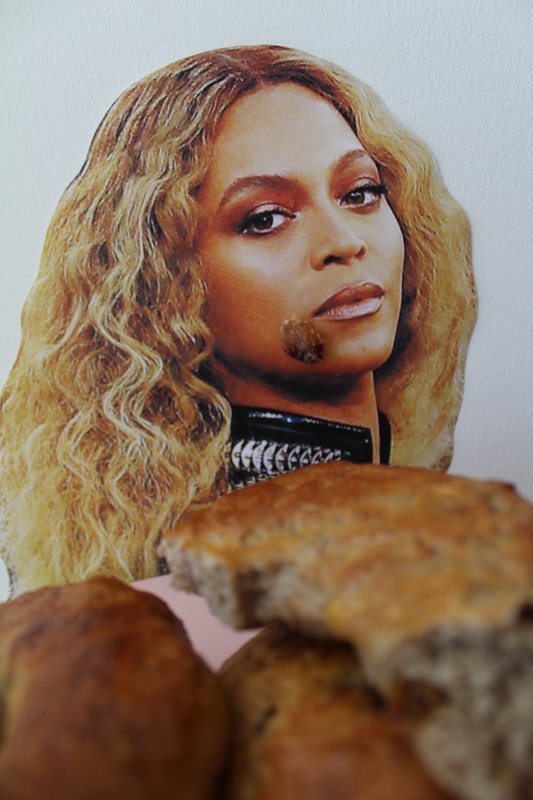 I mean, they are a gift from the gods … like Queen Bey. So get boilin’ and bakin’ and get in formation to celebrate her upcoming nine new Grammys. Serves: one pregnant angel and her babin’ chum. I am the babin’ chum, FYI. Also FYI, it makes 8. Combine the flour, sugar, salt, yeast, cinnamon and raisins in a large bowl for the stand mixer. Using the dough hook by hand, slowly stir in 300ml of warm water until everything is wet. Transfer to the stand mixer and knead for about 10 minutes, or until smooth and elastic. If you need more water, add it a tablespoon at a time. Place the dough in a large oiled bowl and allow to prove for an hour or so, or until doubled in size. While it is proving itself preheat the oven to 180°C. 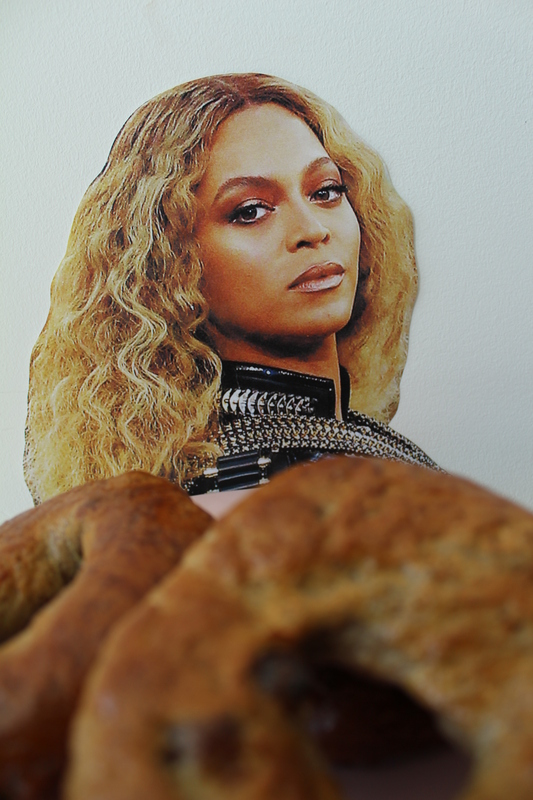 When the dough is as big for its britches as Tay Tay when she beat Bey – remember that controversy? – knock it back to size and break into 8 equal pieces. Roll them into balls and push a finger through the centre to form a ring. Place on a lined baking tray and allow to prove for half an hour. While they are proving again, bring a pot of water to boil. Once the bagels have double in size, drop them into the water one at a time, and cook for thirty seconds each side. Transfer to a wire rack and continue until done. Transfer them to a lined baking sheet, brush with the egg and bake for about fifteen minutes, or until golden brown. Devour, slathered in butter or cream cheese. Like a Queen.